It’s natural for parents-to-be to prepare everything for their little one’s arrival, including making sure that the nursery‘s all set with the right items and products. Registry checklists often include the traditional changing table which draws strong opinions from family and friends who may be divided with some urging to get one and some advising against it. A changing table provides a safe place so your baby won’t be able to roll off during nappy changes. It’s also advantageous for Moms and Dads because the table is at an appropriate height which prevents backpains from bending over. A traditional changing table, however, can cost $200 or more. It’s a considerable amount considering how babies quickly outgrow them. It can also take up a lot of floor space which can be a dealbreaker for those with limited space. Fortunately, soon-to-be-parents faced with limited space or budget can still provide a safe place for diaper changes with any of the alternatives below. One smart solution that should be on your radar is the folding changing table. This changing table is able to simply fold up to be tucked away conveniently when it isn’t in use. When you want to save as much room as possible, these alternatives to traditional changing tables work nicely. Folding changing tables are very popular among people who live in apartments and small condos. The folding changing table itself should be large enough to allow you to change your baby with ease. Most of these folding changing tables are pretty small, but they should work well enough for your needs. You can tuck this table away in the closet or simply set it flush against the wall when it is collapsed. It’s an easy answer to your problems when you have issues with living in a tiny space. This folding changing table is very easy to use. You will be able to unfold it in order to change your baby quickly. The surface should be large enough to make changing your baby a breeze. Storing the table is simple, and it can fit just about anywhere that you have a little bit of room. Once your baby has grown a bit, you may feel that the folding changing table is a bit small. There are larger ones out there, but you likely want to keep it small to save space. Otherwise, this is a great solution that should work well for your needs. Having a crib and changing table combo is probably going to be the smartest solution to your changing table woes. Your baby is going to need a crib, and you may as well make use of this space as efficiently as possible. What this solution does is that it allows your crib to double as a changing table when necessary. There will be a changing table that is connected right to the crib itself for your convenience. You will also find that there are other models that do things a bit differently, too. Sometimes there is simply a changing tray that can attach to the crib. These types are known as crib-top changing tables and they are also a very good solution. Realistically, these two types of things are essentially the same. The design is simply going to be slightly different. The crib and changing table combo units are going to be a little easier to use. Generally speaking, they will have larger areas for you to change your baby. This can be very convenient, but they will also take up just a little bit more space. If you want to save the maximum amount of space, then buying one of the crib-top changing tables is going to be your best bet. This is a convenient solution that will allow you to change your baby very easily. You can always have a perfect spot to change the baby, and it won’t take up that much extra room. If you choose to use the crib-top model, then it will take up no extra space. Either way, you should be able to use this solution effectively. Some people may not have a slight amount of extra room that is necessary for the crib and changing table combo. The crib-top changing table also may not feel spacious enough for your baby. It depends on the size of the child and the size of the crib-top changing table that you buy. Portable changing stations have been popular methods for changing babies for a very long time, too. If you don’t want to use a traditional changing table, then you may wish to simply use your portable changing station every single time you need to change your baby’s diaper. You likely already have a portable changing solution for when you take your baby out to other people’s houses, so you can simply use that. A good portable changing station will include a changing mat and diaper supplies. That is really all that you need to get the job done properly. It isn’t something that requires a lot of thought, and you can actually save yourself some money by keeping things simple. 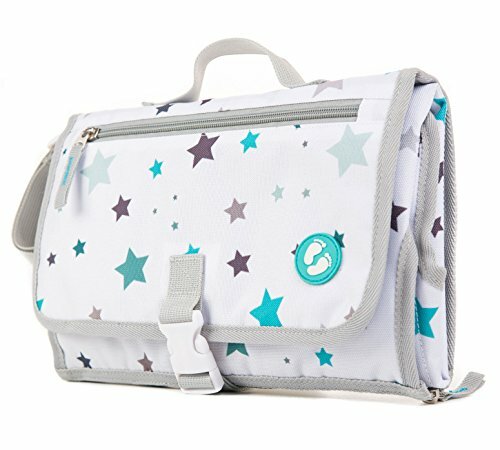 You could decide to buy a nice diaper bag and keep your portable changing solution inside of the bag. This product here is a portable diaper changing pad. It will provide you with a flat surface that you need to change your baby’s diaper. It includes pockets so that it can carry many of the other items that you need. This should make everything simple for you, and there is no reason that you can’t use this solution as a complete changing table alternative. This method for changing your baby could potentially save you a lot of money. Being able to avoid spending money on a changing table will allow you to put that money to use elsewhere. Also, you will be able to save plenty of space through not needing to put any sort of permanent table up in your home. The portable changing station can simply be stored in a closet when it isn’t in use. Having to change your baby on the floor using the mat or on a table may not be the most convenient solution for you. Many people enjoy changing tables due to the fact that they are elevated to a convenient height. You might not have the easiest time changing your baby using the portable changing station method every single time. It shouldn’t be difficult, but it just may not be as simple as some of the other methods due to needing to bend down. If you want to have an option that will save you the most space possible, then consider getting one of these fold-down changing stations. You install this changing station right on your wall. It will screw into the wall or fasten to the wall in some other way. Different fold-down changing stations may have different methods for how they attach to the wall. When you need to change your baby, all that you need to do is fold the changing station down. It normally sits right up against the wall vertically and can then be pulled down into a horizontal position. You won’t have to take up a bunch of room with a changing table and will always be able to change your baby when you need to. It’s a great method that many people are making use of. Installing a fold-down changing station will allow you to save a lot of space. You won’t have to worry about running out of the room when you install a changing station right on the wall. It will fold down and allow you to change your baby with ease. It’s a good solution to your problems that you’ll want to take advantage of if you need the extra room. Having to install this changing station on your wall may be a bit too arduous for some people. It shouldn’t be too difficult to screw everything into place, but it is still a bit much for some people. Those who want a simple solution that will work right out of the box may wish to seek out another method. This is a great option that can save you space, though. It is possible to find a dresser on the market that will work well as a changing station. When you are short on space, it is important to make the best use of your space that you possibly can. This will allow you to use this space for multiple purposes. 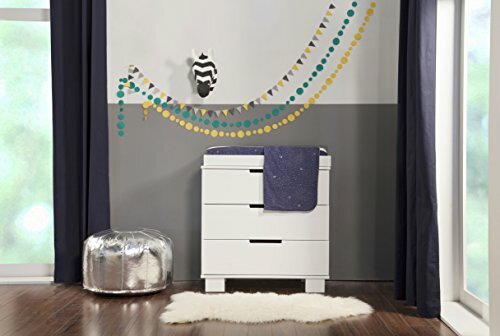 When you have a dresser that can double as a changing station, you will be able to use the surface to change your baby, while making use of it as a normal dresser, too. This will give you a convenient spot to store all of your baby clothes and other important items. If you have been in need of a dresser already, then it makes sense to go ahead and purchase one that can double as a changing station. Some people choose to make use of dressers that they already have around their house to serve this purpose. There are also many different dressers that are specifically made to double as changing stations. The dresser being shown here is a great example of how convenient a dresser and changing station combo can be. There is a lot of room to store things inside of this dresser. The top will act as a safe spot where you can change your baby. It is spacious enough to make everything easy and it will generally work out nicely. This is an option that will help you to save space by serving multiple purposes. You will be able to change your baby very easily on top of this dresser. You can also store many things inside of the dresser for your convenience. As long as you have the room for a dresser in your baby’s room, then this is a sensible purchase. Not everyone is going to have the proper amount of space to fit a dresser. Sometimes people are seeking out changing table alternatives simply due to not having any space to work with at all. In this situation, you may not have room for the changing table and dresser combo. It isn’t too big though, so it is something that can work for many people who live in small environments such as apartments. A desk can replace the traditional changing table as long as it’s at the right height and has a smooth solid surface such as polyurethane. Avoid desks made of old dry wood and look for desks with raised edges on three or even four sides to prevent your baby from rolling off. A desk with a shelf underneath will be very convenient for storing diapers and wipes. Using a desk is a practical and cost-saving option that will still be functional even when your baby no longer wears diapers. Not all desks will meet the said requirements for providing a safe place for diaper changes. The Leander Matty Change Mat lets you create a changing station wherever the need strikes. You can place it on any flat surface and it has a non-slip base to keep it in place. It’s 100% waterproof and easy to wipe down and clean. 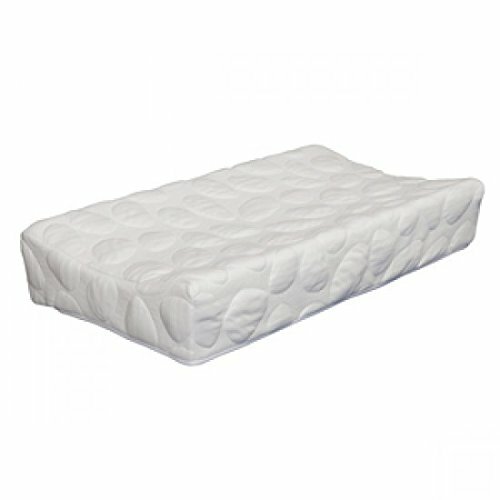 A contoured, cushioned changing pad with safety belt will make changing nappies less of a mess. It’s a plus for both parents and the baby when there’s a toy bar to keep baby entertained. A quilted changing pad with water-resistant internal layers offers comfort and style. It will complete your changing station and can be matched with a wide range of interior design styles as well as perfect for both baby boys and baby girls. It can also be spot clean or machine-washed. It’s a type of Moses basket changing tray that’s handmade from soft seagrass and can be used for other purposes. The Nook Pebble Change Pad is made with all-natural eucalyptus and organic cotton. It has a removable and machine washable cover that’s stain-resistant and waterproof. The wrap is also covered in natural zinc so it’s anti-mite, anti-mold, anti-fungal and hypoallergenic. The SnoofyBee Changing Pad makes diaper-changing stress-free with its patent-pending barrier where you can hang toys and redirect your baby’s curiosity. The changing pad can also be folded into an on-the-go diaper clutch. This babycare mat is inflatable for soft support and comfy lying space for the baby. It’s made of 100% polyurethane so it’s gentle on the baby’s skin. It’s also water-resistant and is very easy to clean with a wet cloth.